Change is a very important concept. As complex to comprehend fully, as it is common in our lives since forever. Over the years, a lot has been written and said about change management processes and techniques, developed to help leaders drive and manage change in their organisations. The concept of change today, however, as per its own nature, has evolved. With the development of artificial intelligence and growing innovation in the area of automation, we are witnessing changes occurring at an ever increasing speed, and becoming more and more exponential. As Yuval Noah Harari notes, we struggle with imagining the scope of change in the future because we keep using the same thinking patterns we have been using for years. Traditionally, when thinking about change we anticipate a disruptive force challenging the status quo, a period of adaptation, and finally stabilisation in the new status quo. However, what is more probable is that constant change will become in the coming years the new normal. This means that both as individuals and as organisations we need to look for ways to become more agile, reactive and adaptable. We need to develop tools and mechanisms to thrive even if we don’t have all the data to predict what future will bring us. What we need to work on is, first and foremost, our own Change Mindset. The Change Mindset allows you to fully embrace the concept of constant change, without fearing the unknown. It empowers you to unleash your creativity to proactively drive and shape change, to write your own story. Ultimately, it plays to the strengths of your whole self, as it mobilises to capitalise on your full skillset rather than staying closed in the box of any specific professional role. 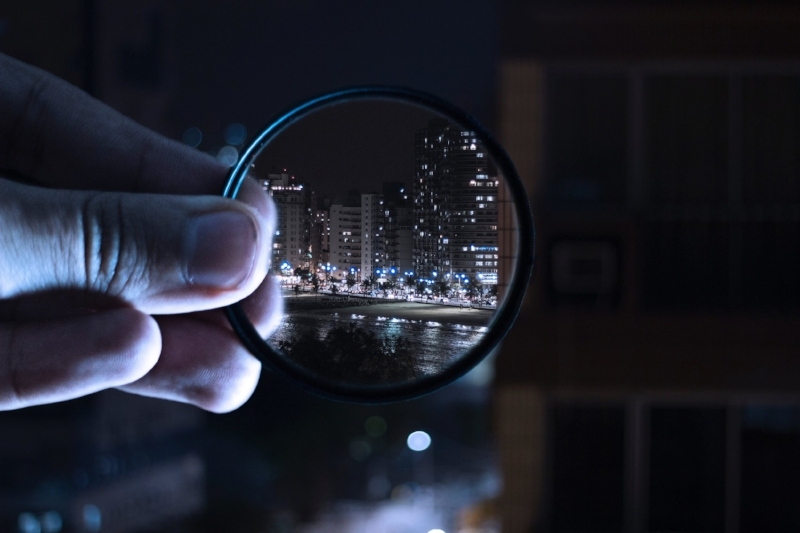 This broader way of perceiving yourself is crucial in ensuring success, as supported by the results of the study by the World Economic Forum on the top 10 Skills needed to Thrive in the Fourth Industrial Revolution. While complex problem solving, unsurprisingly leads the list, skills such as creativity, critical thinking or emotional intelligence have all gained in importance. Throughout the year, in a series of targeted and crisp reflections, I will explore with you ways to develop, practice and empower your Change Mindset. The article has been originally written for HQ - The Association Magazine and published in the February 2019 edition of the magazine, accessible online, here. In times when most people are satisfied with half-relevant and simplified answers, as long as they come in swiftly, it is not always easy to be the one digging deeper. Temptation is high to google your way through. Genuine curiosity is as precious as it is rare these days.It can also be an extremely powerful tool in becoming a better and more authentic leader. Firstly, curious minds are never satisfied with simplistic answers. They always ask: “why?”, look for details, analyse and get to the bottom of things. This allows them to stand on strong foundations, see the broader picture and trust their own judgment. They start and lead new conversations instead of just dropping an occasional answer. Secondly, curiosity opens your mind to new concepts. It makes you seek new experiences, develop diverse interests and grow beyond one specific role you see yourself in. This is the very basis of becoming a leader: you are confident in making unexpected and unconventional connections, bringing inspiring people on board because you know their value just as you know yours; and you don’t feel threatened. You focus on creating something bigger than yourself. Thirdly, it teaches you to ask the right questions – a skill that is often underestimated. If properly used, it can not only showcase your knowledge and help you gather information, but also create lasting and meaningful relationships with people around you. As they say, they may forget what you did, but they will never forget how you made them feel. And we all like to feel listened to and understood. Finally, it helps embrace the unknown and thrive in unpredictable circumstances. Today more than ever things can change by 360 degrees in a heartbeat. To be a successful transformational thinker, it is no longer enough to be able to comprehend the complexity of the world. What is needed is to be bold and feel comfortable leading while knowing that you don’t know most of the variables. May curiosity be with you! The article has been first published as part of the HQ - The Association Magazine's #85. All digital editions of the magazine can be found on their website, here. The recent Volkswagen emissions scandal is a yet another signal indicating the clear need for stronger ethical leadership in today’s business environment. 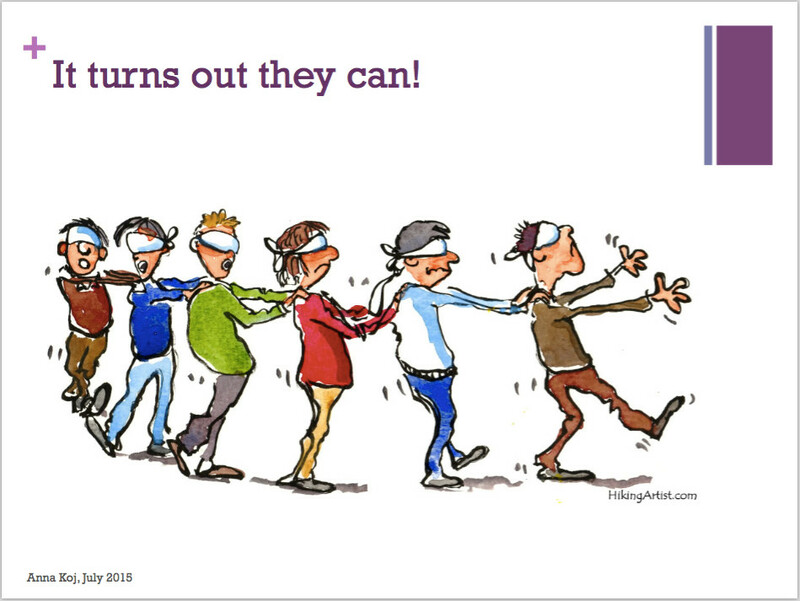 It can also provoke interesting reflections on the topic of ethical blindness (for a general introduction to the concept see my previous post on Unethical decision-making in organisations & what to do about it) in the car industry. While it is clear that the Volkswagen software has not been set to cheat the emissions tests by mistake, we still don’t really have enough details, thus it wouldn't really make sense to second-guess, risking to fall into the trap of blaming all or poorly trying to excuse some. Instead, let’s use the topicality of the issue to dive deeper into certain ethical blindness triggers, which are common, although not exclusive, for the industry. Regardless of the individual responsibilities in the current scandal, a substantial debate on how our societies and businesses function today would be useful to address certain widespread ethical blindness inducing elements. It is an issue as relevant to the key decision-makers in top industries as it is to all of us, because ethical blindness is not only limited to those who actively engage in unethical doing. It can and it does affect witnesses of moral misconduct, as well (Francesca Gino and Max Bazerman from the Harvard Business School have done some more in-depth research on the issue). So, which are the factors that can prompt gradual erosion of our internal moral compass? People interpret what they see and hear. They familiarise what they experience. 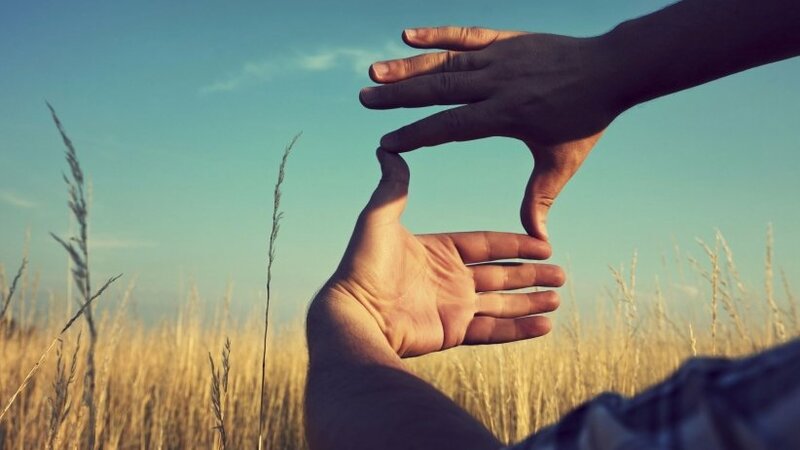 Framing can be a natural, internal process, through which individuals make sense of the reality they live in, a process of creating mental maps, through which they structure their world. It can also be an external, intentional process aimed at presenting certain situations in a particular perspective, which makes it an important tool of influence. In both cases, the impact of frames on the decision-making process is huge. Firstly, because we often do not realise they exist and therefore have no conscious control over them. Secondly, because by nature, frames are limiting. Applying the concept to a business environment, say the debated car industry, if playing on the edges of the grey zone of emissions tests is successfully framed as normality, then overriding the relevant rules and laws becomes simply a yet another way of winning with the competition. Just that. Especially if the frame is reinforced by other elements, which additionally legitimise certain behaviours and discourage independent critical thinking. Time pressure is one such element. It can affect the decision-maker on multiple levels. Principally, by influencing negatively his or her ability of judgment. Secondly, by adding the element of stress, which can prompt over-compliance and groupthink. Furthermore, when making decisions under time pressure, individuals often resort to heuristics, simplifications based on selectively chosen and usually promptly available information. Naturally, the risk of losing important elements in the process, such as the ethical dimension at stake, rises exponentially. Stimulated, additionally, by high levels of competition within industry, decision-makers feel they can't allow themselves to lose precious time because they will remain behind the trends. Quick wins are needed, decisions are often taken in a gambling mode, with more or less calculated risks. Finally, what also needs to be mentioned is the role of organisational context factors, such as for example unrealistic objectives and the culture of fear. When employees - on all levels of the hierarchy - face constant dissatisfaction with their achievements and see the benchmark being raised above the realistically achievable goals, rarely will they feel positively motivated to improve their work. In a healthy environment, raising the expectations bar higher might indeed bring people to give their best and to go over the expected result. In a world where no missed opportunities are accepted and where one can’t spare any mistake, however, it will rather push individuals to an almost primordial fight that sees no rules and considers no morals. When this, additionally, is topped with a pervasive sense of fear and instability, not uncommon in such a highly competitive industry as the car producing one, employees tend to develop what is called a tunnel vision. They identify what in their opinion will make the boss happy and they concentrate exclusively on making it happen, while often loosing sight of a broader picture. Tunnel vision leads to silos thinking, which brings us back to limiting self-imposed or externally imposed frames. These are only a few of a number of factors that can invoke ethical blindness. They all, however, have a common denominator, which is the crucial role of the leader. In a healthy working environment leaders promote ethical vision and they are aware of the risks coming along with a fast-paced and stressful everyday routine of the industry. They filter and stay on top of the things, while giving the general direction to the whole team. It is also their role to ensure that people are not afraid to speak up if they see moral issues at stake and that these concerns become central to the whole organisation's identity. More and more scandals of the recent Volkswagen type indicate that we're still missing a lot when it comes to sustainable, healthy leadership. There are individual examples that can lead the way but a broader discussion on the issue is needed not only to punish the guilty ones when bad things happen but rather to promote positive change for the better. Originally posted by Anna Koj on LinkedIn, here. While recently preparing for my MBA graduation ceremony I was forced to gather thoughts and creatively squeeze hundreds of pages and hours of studies, books, articles and theses read, contemplated, studied and written in a brief speech that would outline the main ideas behind a complex problem I have been working on for quite some time, now. My interest in the issue of unethical decision-making in organisations has been prompted by two contrasting reflections about today's society. On the one hand, we live in a world where more and more often people are not willing to compromise on their personal values and convictions simply to earn more money or advance in their career. On the other, we also live in a world that never stops spinning and puts a lot of pressure on professionals, often requiring them to be constantly present, performing and on top of everything. Can people of high moral standards and integrity engage in unethical doing without even realising it? We assume that people always act consciously and knowingly when choosing whether or not to do something that can be perceived as unethical. However, there are actually a number of factors that can more or less subconsciously interfere in our decision-making process, influence our actions and, ultimately, make us do things that we perceive as normal, regardless of their dubious ethical character. We can, in fact, become ethically blind, enter into a state of a temporary inability to see the ethical dimension of the decision at stake. 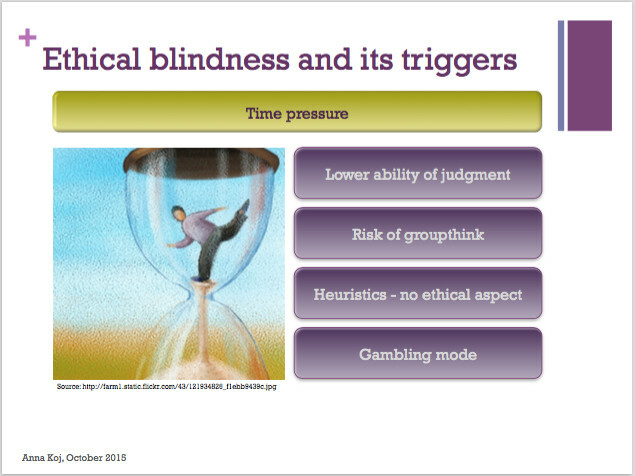 The concept has been introduced by three scholars from the University of Lausanne: Guido Palazzo, Franciska Krings and Ulrich Hoffrage, who note that ethical blindness is not at all dependent on the nature of the decision-maker or any innate personal characteristics. It can, on the contrary, 'touch' anyone and result from a number of factors, which are often outside of our control. These triggers include, i.a. framing, strong contexts, routine, use of specific language, time pressure, intercultural aspects and others. I might dig deeper into these individual aspects and their characteristics in a different post. Here, I would like to underline one specific consideration, which came to my mind as I studied the issue. Most of the above-mentioned factors can be identified as natural processes. We can try to understand them, channel or counter them if we see the danger of unethical doing coming, but they are in itself a natural way for people to interact with the environment around them. For example, we all have our own luggage of experience, our cultural background we come from and these clearly - in a more or less conscious way - condition our decision-making process, both on a personal and a professional level. At the same time, some of them can also become a manipulative tool, voluntarily and willingly used to induce others into ethical blindness and to prompt unethical doing. Think of how media can influence the thinking of large groups of people solely by framing the worldview they present in a distorted manner, to serve a concrete purpose. Decision-makers in organisations can resort to the use of aggressive language in order to promote a 'we-them' division and build an atmosphere of unhealthy rivalry with competitors that are seen as absolute enemies, against which we, then, are ready to do anything it takes. All of these have a great impact on our decision-making already individually. Now, they never really occur in isolation. It is interesting to see how they can group and boost one another's effect. Clusters of mutually reinforcing elements exponentially increase the risk of vicious circles of prolonged periods of ethical blindness. 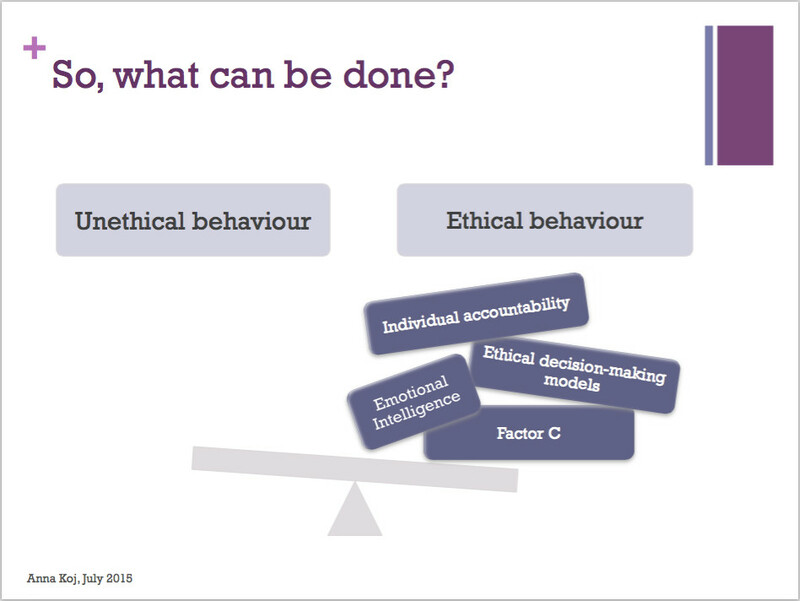 So, what is it that sets the ethical tone in organisations? The role of leaders is crucial. They can drive the way employees perceive the ethical dimension of their doing and foster healthy organisational culture, which in itself constitutes a strong backbone of the ethical atmosphere in an organisation. These two elements are constantly influencing each other and build a crucial axis in putting ethical values high in the hierarchy of the organisation's priorities. What concretely can leaders do, however, to increase ethical awareness amongst their teams, foster healthy leadership and organisational culture? Again, there are a number of initiatives that can help, starting from the more traditional ethical decision-making models, which can come in handy and helpful in certain situations, through increased levels of individual accountability, binding for each and everyone in an organisation, including the top management, up to a better understanding and greater importance being given to seemingly less concrete, yet provenly greatly effective elements, such as emotional intelligence and Factor C.
Factor C stands for the so-called Collective IQ (for a broader overview take a look at this interesting HBR article), which comprises of three elements that researchers have identified as crucial in boosting fruitful team work, i.e. high levels of social perception, equal participation and, finally, more women involved in the decision-making process. The mysterious Factor C still requires further studies but is already a clear indicator of the direction, in which organisational decision-making is heading. Soft skills gain on importance as they allow for a better understanding of our motivations, which have been changing over time. This thought follows the initial assumption that young people in today's world are looking for something more in their career path than simply more money.